Listings are Free for CCBA Members & Only $10/yr for all others. Funds help to support this site. Over 24,000 Hits on this Page last year alone! Please make checks out to Paul Cammaroto. New additions will appear at the top of the page. If your boat sells, please tell me so I can remove it. 1. Active member boats for sale and paying listers Only. The file below is current and complete. For Sale: 2014 Marshall 22 “Merryheart”. 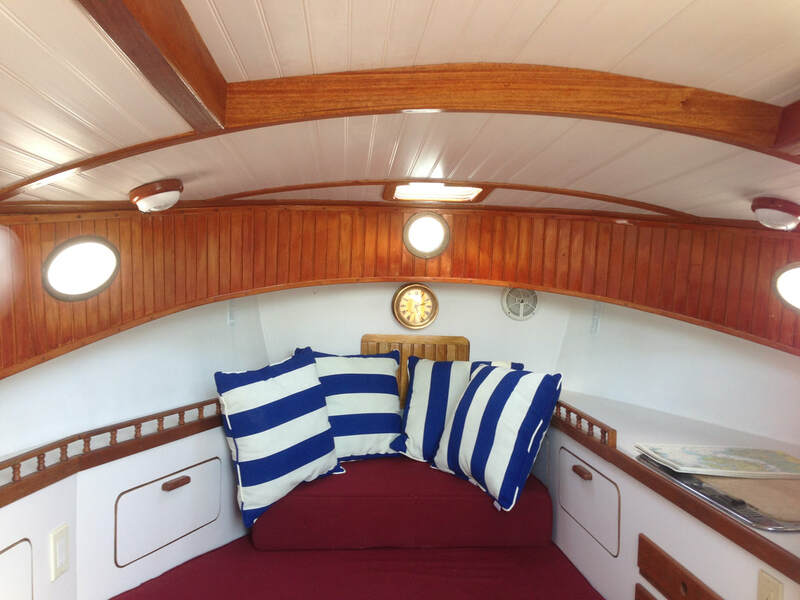 A recent-vintage boat in excellent condition – in-water, completely turn-key, ready to cruise or day-sail. 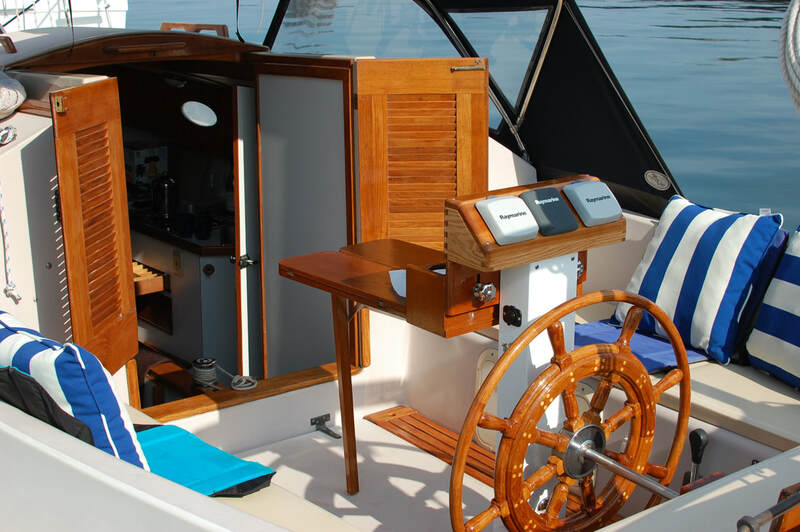 It has a long list of options, including a heavy-duty autopilot, cedar interior bulkheads, dodger and other canvas, bowsprit anchor mount, and winter cover with frame (a full list of features and options and additional photos are available from the owner or from Salt Yacht Brokerage website.. Asking: $75,000.PRICE REDUCED. Located in Rock Hall, MD. For Sale: 1975 Legnos 20 hull #19 named ”Gull”. One of two big rigs modified in 1982 from 272 sq ft to 344 sq ft. Lengthened spars and mast, enlarged rudder. Hull epoxy sealed in 1998. Bowsprit w/Bruce plow design anchor. Electric & manual bilge pumps, running lights, 10 gal water tank and 10 gal diesel tank, sink, stove, porta potti, 2 bunks, Marine VHF, antenna on mast. 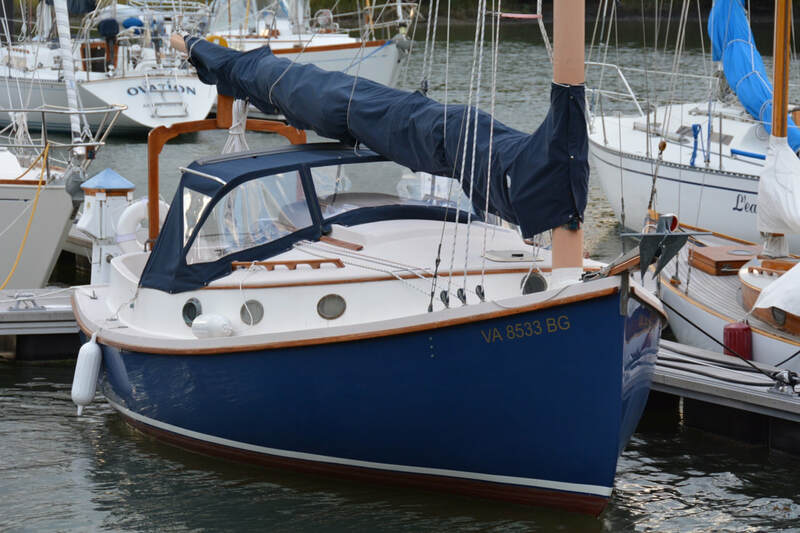 New sail 2011 in excellent condition, beige sail, hatch and tiller covers in 2017, New Westerbek 12c2 diesel, 2011, low hours, yard maintained 3 blade prop. 2010 Load Rite, 5 star tandem axle trailer, surge disc brakes, bearing buddies, never in water. For Sale: 1982 Clark Mills SunCat CATS AWEIGH - from the same molds as Com-Pac Sun Cat. Marconi rig with hinged mast, sail area165 sq.ft., 20’LOA,15’LWL Beam 8’Draft 2’. Special keel model (no center board with OEM bowsprit and small roller furling jib. Mast height approx.28'. Boom length: 14' 6". Hulls pray painted and deckrolled/brushed. New tinted Lexan portlights. New batteries,new batteryswitch,new custom circuit panel,new navigation, anchor and steaming lights. New automatic bilge pump, new Guppy(Whale) manual bilge pump (accessible from cockpit). Raymarine ST1000 Tiller Pilot. Recent standing rigging, new running rigging, all teak recently oiled, new bottom paint. Bronze through-hulls, Danforth anchors fore and aft. Trailer has never been in the water. Appropriate vintage 2.5HP Nissan Outboard. Original sails. I am the 2nd owner. More than $6,000 spent on restoration. Asking: $7,500 OBO, LocatedPortSt.Lucie,FL will consider delivery for expenses. For Sale: Herreshoff Eagle 22 #113 Built in mid 70’s by Nowak & Williams, original sail, 24 volt Navigator electric motor dual propeller along with a 2003 Johnson 5HP outboard. Black Sunbrella sail cover, green cockpit cover. 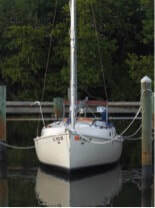 Asking: $8000, located Cobbs Creek off the Piankatank River, VA.
Thelma-Marie nee Grandmary, 21’3” LOA, 9’6” beam, 420 sq ft sail with many new improvements. Halyards and topping lift lead down to a block on a pylon on deck eliminating interference with gaff jaws, bottom redone taken down to the fiberglass, imperfections repaired with glass in epoxy. Epoxy barrie rcoat, faired with second barrier coat(Interlux2000e), painted with Aquaguard. New bimini, cockpit cushions, sail cover and storage cover. Powered by a Phaser Marine engine that is based on a three cylinder Kubota diesel engine rated a t19 hp. Shore power panel installed. New water tank and new through-hull fittings/seacocks installed.